It's been quite a while since my last update. I was out for a while on a special mission but back to FOB Sharana safe and sound! Thank goodness! Improvised Explosive Devices (IEDs) continue to be the number killer of troops. Our route clearance battalion is doing a great job of detecting IEDs but our MRAPs/Humvees can only take so much beating. This battalion has a tough job as their mission in life is to travel along our main supply routes everyday and find IEDs. Since my last updates, we lost two more soldiers from Task Force Castle as a result of IED explosions. The reality of war is still evident over here. My staff and I continue to make good progress over here in helping the Afghans. I recently met with the provincial governor to discuss potential expansion of our engineer construction skills workshop initiative and other construction projects. All of our graduates have gone on to find jobs with local contractors so it is very rewarding to see the hard work is paying off as well as the Afghans becoming self sustained. We continue to build bridges, renovate schools and hospitals, wells, etc. for the people of Afghanistan. Well, the winter months have approached and it is really cold here given we're at 7000+ft of elevation. I am really missing the warm and sunny Arizona weather. I also thought I could rest during the winter months since my Taliban friends are probably heading back to their caves and hide for the winter. Well, I was WRONG! My highly motivated commanding general of the 101st Airborne Division has given the order that he wants to take the fight to the enemy and not let them hide during the winter months. So what that means is that instead of keeping warm and sleeping through the cold winters, we're going to be busy chasing the Talibans so that they will not be able to re-supply, re-group, and plan for a spring offensive against coalition forces. We're now busy making preparations to execute our winter operations and keeping them off balance. 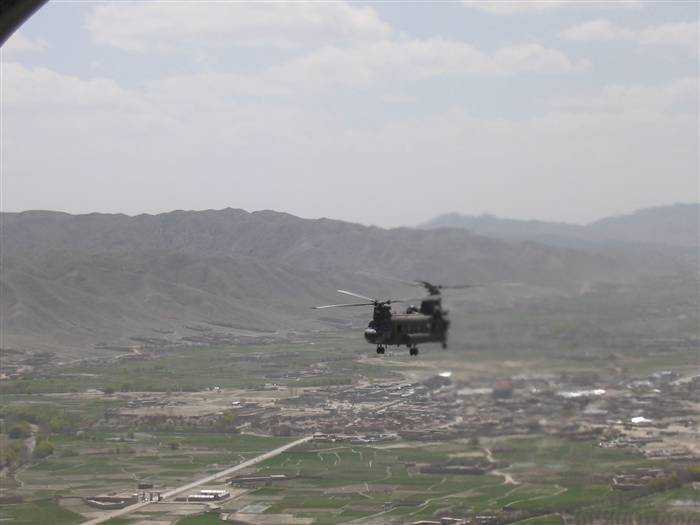 Attached are pics1- aerial view of Afghanistan during my tour in a Chinook helicopter 2- aerial view of Afghanistan, poor country right?